A Chocolate Bundt cake made quickly within a few hours and topped with a sugary but tangy lime and vanilla glaze. The Bundt Cake was sweetened with coconut sugar which left the cake not to sweet. The sugar glaze complements the dark chocolate and the light sweetness of the Bundt cake. Serving at least 15 People, this Bundt Cake is more on the leaner side of cakes. This winter in Boston has been an up and down in degrees Fahrenheit. From freezing cold minus degrees weather to the warm days currently making long walks through parks possible. The blizzard during the Christmas days left meters of snow on the streets and was followed by snowy days throughout January and now February. The feeling of sitting at home and working and suddenly seeing thick flakes of snow coming down forming thick layers of snow on the ground, is priceless. The weather in Boston has been flaky at best. The thick snowy flow gone by the end of the day and replaced by slippery ice. Now, a mere week after its all warm weather and almost a sweet reminder of spring. No trace of snow nor ice. February is passing by in a flash with another trip coming up. In January I was busy processing all the impressions from my Trip to Mexico and settling back into a routine and getting back into blogging mood after taking a long hiatus from the blog. At the same time I have had a lot of ideas and recipes hiked up in the lack of my head just waiting to try them and getting new props to make the photographic magic happen. Now I have gotten back into my blogging game, trying new recipes, photographing like crazy and letting all that creativity flow again. 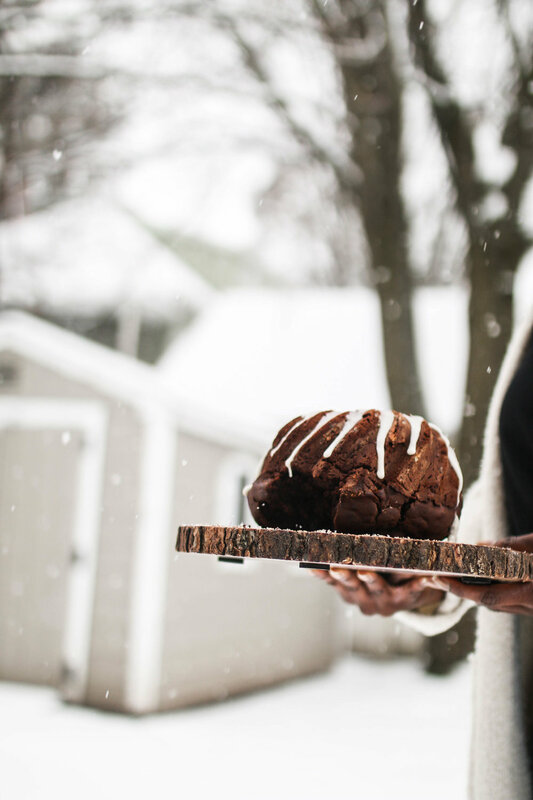 Though the Chocolate Bundt cake is on the simple side of cakes with a more experimental glaze, simply getting back into the kitchen and baking has given me the boost I needed to simply get started and going again. Melt the dark Chocolate in a water bath until the chocolate is molten. Process the vegan eggs as directed on the packaging. Then mix all the dry ingredients together. Now add the wet ingredients and mix until well blended. Line the Bundt cake form with butter and flour. Fill the Bundt cake with dough and bake the cake at 180°C for 35 Minutes. Let the Bundt Cake cool before taking it out of the form. For the Glaze Mix the Juice of a Lime with Powdered Sugar, Water and the Vanilla Scent until you have a liquid glaze.